I am a real believer in the corner store, and quite possibly one of their best customers internationally.Corner stores are a good litmus test of a place's character and culture. Don't believe me? What type of people go in there? What type of goods to they carry? Where are they located and when are they open? When do people shop? Yup, you can learn a lot from them. In New York City, we don't really have "corner stores." We call them "bodegas." In fact, I didn't even realize this was a New York thing till I met Americans from other parts of the country... in Israel. When I lived in Williamsburg, there were three main population groups (hipsters to the North, Latin Americans in the middle and then my Satmar Haredi brethren below South 8th street). 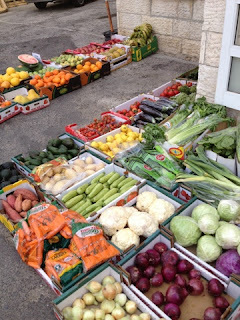 Each area had its own characteristics with regards to the local bodega and each bodega took into consideration the local population. I can't quite remember them in the northern area of Williamsburg, mainly because I lived and worked farther down South, though I do remember the newly constructed, glossy 24 hour pharmacy with beer on tap and some fresh produce (ah, liberals in America...) and organic juices. Magazines galore to match the glossy exterior. In the central section of Williamsburg, the stores had mucho Latin American products--tons of goya spice mixtures and juices for example, and stuff with Spanish all over it. 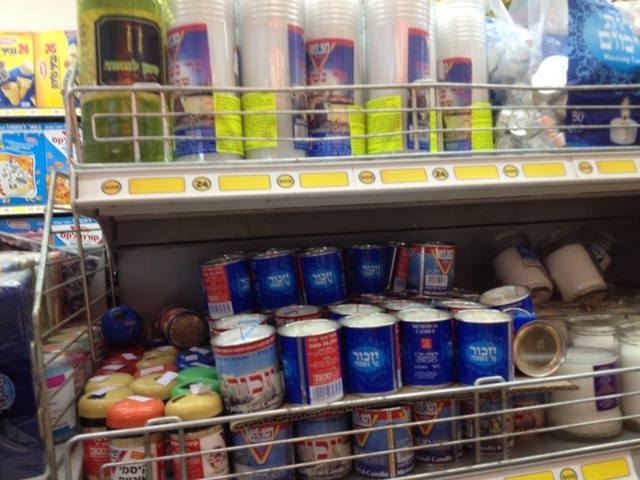 And lastly, in the Satmar section, corner stores were more like mini-supermarkets, with Israeli products dotting the shelves. No magazines here that I can remember. Some Yiddish. 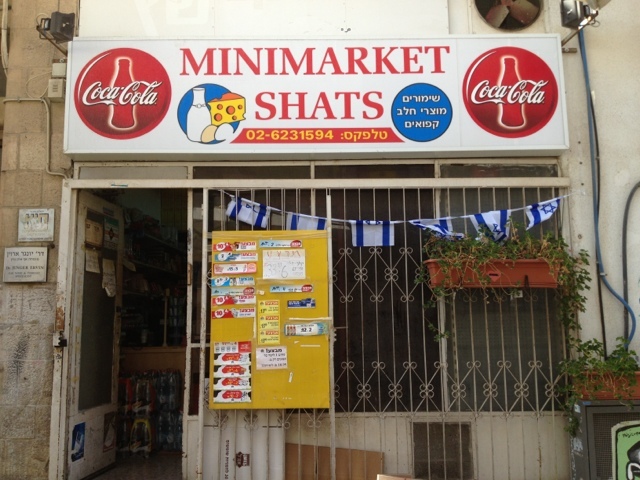 And now, on to my time in Israel.... Macholet, or corner store, is one of those words everyone uses in Jerusalem, even people who don't speak Hebrew. Interestingly enough, it was a word that I didn't learn till after I started living in the "real world" (i.e. working, albiet in an American company). Then, there are the local macholets like the one we all visit at work, that is actually shutting down in the next few weeks because the landlords want to renovate the building. We are all a little sad at the office to see them go. They had been open some 20+ years. All corner stores in Jerusalem seem to have their fair share of fresh produce, ranging from so-so to really excellent quality. Sometimes, there is fresh-squeezed juice, especially of the orange variety. 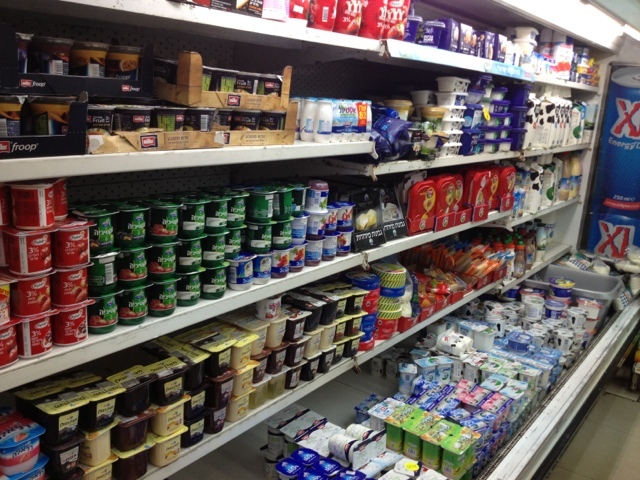 A great selection of yogurts and dairy products. A great selection of candy and gum and cigarettes. Newspapers (English language ones too, depending on the 'hood) and often magazines. 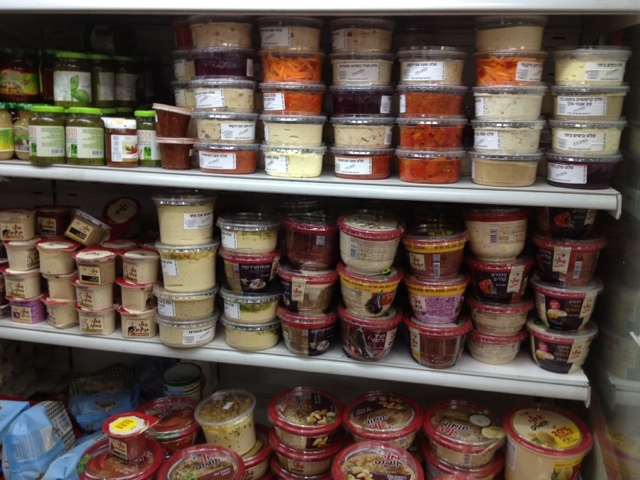 Salatim (dips like hummus and babaganush). Baked goods like cookies and bread that look semi-locally made. Sometimes they even have specialty items, like American Reeses or Bailey's. 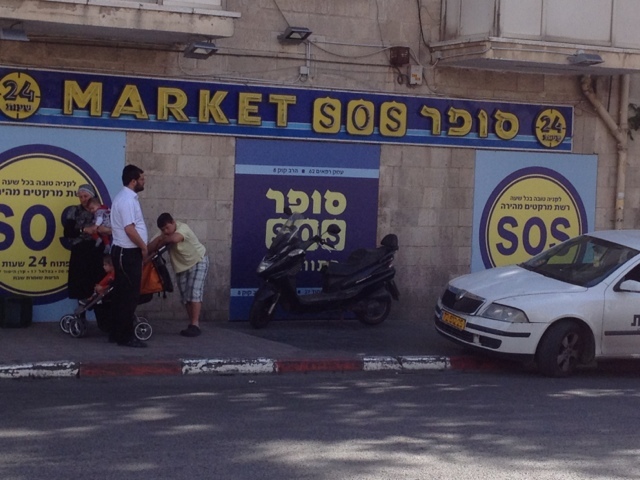 And of course, the random (they are Israeli, afterall) like Hanukkah oil in the middle of the Spring. Quite often, they even have a space to sit in outside, under the sun... or, as is the case in the cheapest macholet I have found in the center, the owner's friends will sit on crates and talk to him, while he smokes a cigarette and rings up customers. Humble corner store or not, Israelis love to sit and chat. See, there really is a lot to say about the corner store.